The Hebrew Words Translated "Worship"
The Greek Words Translated "Worship"
What Does it Mean to 'Serve' the Lord? How the Prophet Daniel Served The Lord. Serving God by Serving Others. The primary element of true worship expresses wonder, awe, and humility, at the grandeur, infinite power, and sheer majesty of the transcendent God and, obviously, it should be a significant part of every believer's life. But perhaps we need a better understanding of how the Bible defines worship. People express preferences for traditional or contemporary worship. Some lean towards more formal worship which involves certain rituals. Others approach worship in a free and unceremonious fashion, often looking for "worship" that is alive, authentic and/or inspiring. Many of this type of person seems to believe that the more they can work themselves into a state of fervor, the more intense their emotions get, the more they can let themselves go to the music and lyrics of the song, the more real and relevant their "worship" is. Since all too many seem to have confused tradition with true worship, the question that has to be answered is what exactly is "worship"
However, while the singing of hymns can be incorporated into genuine worship, The Biblical meaning of worship is far more than songs of praise. Like so many other words in the Christian vocabulary, "worship" can become a meaningless cliché if we do not take the time to consider what exactly the Bible means by worship. The problem is that most attempts to define the term or elaborate on the subject, center around the English word "worship" which is the translation of several Hebrew and Greek words used in the Scriptures. Most dictionaries give a similar definition of "worship". For example Merriam-Webster says it is the reverence offered a divine being or supernatural power. . It has also been defined as the act of expressing such reverence (ceremonies, prayers etc.) The word "worship" is also commonly used as reverence and adoration of other objects. (Ex. He worships the almighty dollar). Incidentally, "Worship" is derived from the Old English weordhscipe, which means the "condition of being worthy". The original sense is preserved in the title "worshipful" , inasmuch as someone with the title of 'worshipful' is considered worthy of honor and respect etc. While there is no question that God, above all others, is worthy of honor and respect, there is a little more to the Hebrew and Greek terms translated "worship" that just someone who is "worthy". It takes some study of these terms to come to a more complete understanding of what the Bible means when it says "worship". Although a critical study, it is not a very complicated one. Every time shâchâh occurs in the Old Testament, it was translated according to the context. Similarly, Jacob did not "worship" Esau, nor did Moses "worship" his father in law. It was purely a physical act of respect, different forms of which are seen in many middle eastern countries, and in India, to this day. Because one can bow down to another without "worshipping" them (as we understand the term), the NASB added the words "in worship" to Genesis 47:31 (below), so that it is understood that Jacob was bowing down to God. 2) âbad, literally means to work (in any sense), even working or tilling the land to grow crops. Note: There are several instance in the Old Testament where both words, âbad and shâchâh, are used together in some sentences. 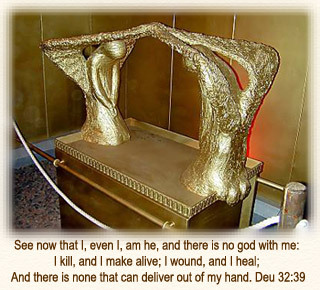 The people being often warned not to serve, or bow down before, other gods/graven images. Yet, it is only in a handful of cases that proskuneo has been translated into the English "bow down" or "prostrate". For example.. So the slave fell to the ground and prostrated (proskuneo) himself before him, saying, 'Have patience with me and I will repay you everything.' [Matthew 18:26 NASB] Note: the fact that the phrase "to the ground" was put into italics in the NASB, means that it did not exist in the original text, but was added for clarity. Because the general idea of worship that we hold today is so far removed from the literal meaning of the Greek word proskuneo, using "worship" in certain verses could be very bewildering. For example, the KJV version of Mark 15:19 says the soldiers spat on Jesus, and "bowing their knees worshipped him" which, to the average English reader, would be a contradiction in terms. You don't spit on something you worship. The NASB, seeking to clarify this, says the soldiers were mocking Jesus as "King of the Jews" ... by kneeling and bowing to Him. All of which could have been averted if proskuneo, had always been translated "bow down" or prostrate, which is what the word means. However, there are two other Greek words, both used rather sparingly in the New Testament. Latreia, used 8 times, is a verb that means "service", and reflects the concept of the Hebrew âbad, as demonstrated by the following verse. The priests were physically performing the acts of worship which God had appointed - burning incense, etc. Luke 1:9. Therefore I urge you, brethren, by the mercies of God, to present your bodies a living and holy sacrifice, acceptable to God, which is your spiritual service of worship (latreia). [Romans 12:1 NASB]. Note: The KJV translates the second part of the verse "which is your reasonable service"
Obviously although serve and worship are two sides of one coin, they mean different things. The Greek words sebomai, used ten times in the New Testament, means to venerate or revere. In the NASB it has been translated worship [Matthew 15:9, Mark 7:7, Acts 18:13, 19:27], worshiper [Acts 16:14, 18:7], devout [Acts 13:50], or God-fearing [Acts 13:43, 17:4, 7:17]. A derivative, sebazomai is used once.. in Romans 1:15 where it is translated "worshiped"
sebomai, which means to venerate or revere. Many consider serving the Lord as doing something related to religion and church... attendance at weekly church services, the giving of tithes and offerings and generally being nice people who haven't actually murdered anyone. However, we cannot compartmentalize our lives, but have to serve the Lord wherever we are, and what ever we happen to be doing. Additionally, we should look at some very illuminating examples of what the Bible describes as service to the Lord. Daniel and his three friends refused to eat of meat forbidden by Mosaic law, although their daily ration was from the king's choice food and from the wine which he drank Chapter 1). They refused to obey the injunction that, for thirty days, anyone who made a petition to any god or man besides the king, would be cast into a lions' den. Even though Daniel knew that the document was signed, he entered his house (now in his roof chamber he had windows open toward Jerusalem); and he continued kneeling on his knees three times a day, praying and giving thanks before his God, as he had been doing previously. (Chapter 6). Daniel and his friends put the Lord and His word well ahead of any other considerations including their own lives. Everything they did was in simple obedience to the Lord's commands... to follow His law and not to serve any other Gods. In other words... obedience. or money does. It cannot be both ways. .... why should we imagine that it is possible to come before God for corporate worship in a irreverent manner? Contrary to what we seem to believe, God will not accept anything we happen to offer... even if we happen to think it is fitting and good. Be warned that music, verbal praise, and the many "amens" and "Hallelujahs", all of which may appear as very successful worship to us, may not even be considered worship by the Lord, simply because because He looks much deeper than what might be surface expressions. He made it very clear, on more than one occasion, that the offerings, the feasts and festivals, solemn assemblies, music, and even prayer had become a burden to Him. In fact, He may consider some of our worship meaningless and even despicable. Think about that for a moment. Is it possible that you return from church on Sunday morning happy at how much you sang His praises and how good the 'worship' was, blissfully unaware that the Lord turned His face away from you and did not accept your worship. Worse, He asked why you dared to tread His courts with your hollow and worthless offerings, and music He did not even want to listen to? In other words He does not need our sacrifices because everything belongs to Him anyway [Also See Acts 17:25]. However, He would not reprove them for their sacrifices and burnt offerings [Vs. 8], but He required more than mere rituals, He required offerings that came from the heart and expressed their gratitude and praise. In verses 14 and 15, God goes on to tell His people to offer a sacrifice of thanksgiving, pay their vows to the Most High, and call upon Him in the day of trouble. In short, acceptance and approval cannot be found by mere outward forms. He doesn't need our religious ceremonies and, unless they are accompanied by godliness, they are worthless to Him. Note that the people supposedly took the best of the sheep and oxen to offer in sacrifice to the Lord, which they obviously considered the right thing to do. However, the bottom line is that they, with the tacit approval of their king, disobeyed the Lord... something He did not take lightly. He did not overlook their disobedience because they intended to sacrifice the sheep to Him but, since they were a nation under a king, held Saul responsible. "in a flagrant act of irreverence, presented an offering before God that only the High Priest was allowed to make, in a location where they were clearly forbidden to be, using coals of fire taken from a source other than the one clearly commanded by the Lord God. Worship is not something we do, such as praying, singing, kneeling, at certain select times, but consists of who we are, and what our attitude is towards God at all times. True worship remains with us all through the day, and colors every aspect of our daily lives. Unless accompanied by godliness, our religious ceremonies are worthless to Him. The Samaritans were descendants of the intermarriages between the Hebrews who were not deported after the fall of the Northern Kingdom in 722 BC, and the heathen from other lands who were brought in to replaced the dispersed Israelites (2 Kings 17:23-24). The Jews of the Southern Kingdom of Judah therefore considered them half-breeds. It is believed that the Samaritans were among those who offered to help rebuild the temple after the Babylonian captivity (Ezra 4:2-3), but were rebuffed. The Samaritans differed from the Jews in several key ways. For example, they believed their line of priests were legitimate, and accepted only the Pentateuch as authoritative (the Prophets and Writings were not considered divinely inspired). The relationship between the two nations was definitely strained, and eventually the Samaritans constructed their own temple on Mount Gerizim. Jesus said there are "true worshipers" which, by implication, means there are false worshipers. Men cannot worship God any way they choose. True worshipers will worship the Father in spirit and truth. In Spirit: The hour was coming when the place would not matter... men no longer had to go to the right place to find God's presence, but would have to go to the right person... Jesus Christ. External worship in the form of rites and ceremonies mean nothing. Only the human spirit, that has been transformed by being born again, can worship in a way that pleases God. As Paul told the Romans... only those that have the Spirit of God can please Him. In Truth: The second phrase Jesus used was that the Father had to be worshipped "in truth", which is particularly significant in this day and age of great apostasy. Men can only worship God in truth... which means the God we worship must be the true God, and we have to worship Him in accordance with what He has divinely revealed in His Word. Worship that is not scripturally accurate, but consistently deviates from the Word of God, is meaningless. However, in order to “worship in truth” we have to know what the truth is. It is not enough to be merely religious. It is not enough to be sincere and zealous. It is not enough to have our 'hearts in the right place'. ... We have to be right in what we are religious, sincere, and zealous about. The Father is not seeking worshipers, but a particular kind of worshiper... one who meets these two criteria. has to begin with a vision of the authentic God, not the superficial lightweight that presides over too many of our modern churches. The chances are good that our worship is authentic and pleasing to Him. A.W. Tozer, Keys to the Deeper Life (Grand Rapids, Mich.:Zondervan, 1957), 87-88. A. W. Tozer. Man - The Dwelling Place of God. Chapter 29...Religious Boredom.